7 Best Kauai Snorkeling Spots | Videos, Photos, Parking, Facilities & More! Ke’e Beach, at the tippy top of Kauai’s north shore, is definitely worth the beautiful drive. When traveling by car, this Kauai snorkeling spot is the closest you can get to the world-renowned Na Pali Coast. (If you want a better look, hike up to the cliffs or take a boat.) In the summer months, the water at Ke’e Beach is usually calm, so summer snorkeling is amazing. The rest of the year, strong ocean currents can present real hazards for anyone in the water. No matter when you’re on island, Ke’e Beach itself is always magnificent. There is a forest growing just back from the sand, where leaf-littered paths wind through the trees, and ravenous mosquitoes fly in wait. For a more challenging hike with unparalleled views, climb Kalalau Trail! The trailhead is found to the left of the parking area, just before you hit the sand. (Are you excited, yet?) Get an early start if you want to find easy parking. A variety of fish have made this area their home. You’ll see unicornfish, goatfish, needlefish, and many kinds of wrasses. There are also coronetfish, sea cucumbers, several species of butterflyfish, and babies of many different fish species. There is a chance to see a turtle here. 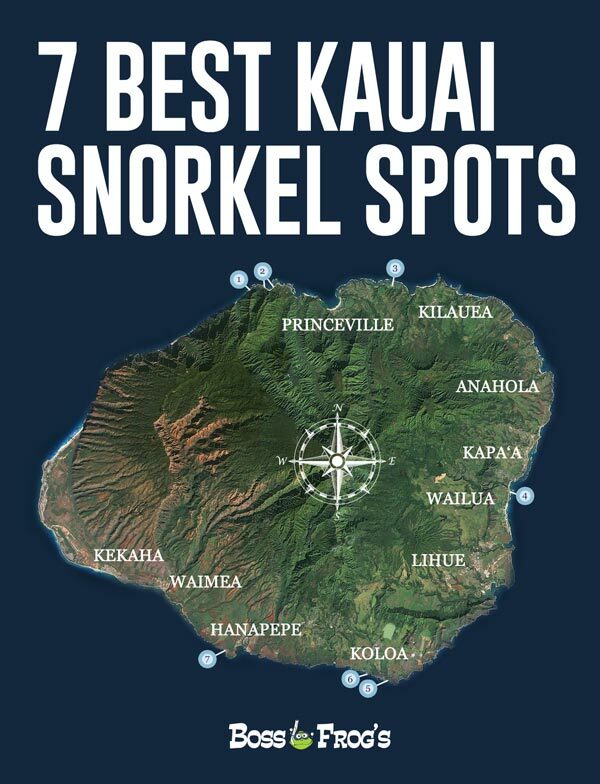 Swim to the very middle of this Kauai snorkeling site for the most colorful fish and coral. To enter the water, avoid the left hand side, but otherwise go straight from the sand into the shallows. The snorkeling area is bordered by large lava boulders toward Na Pali on the left, and sand on down the coast. Off shore and beneath the surface, tall stony plateaus block some of the wave power from reaching the beach. Along with that rocky habitat, there is sand topped with boulders topped with coral. Most of the marine life is located in the center of this swimming area. Do not swim along or around the rocks to the left. The current can be very dangerous there. When you’re visiting Ke’e Beach, always talk to the lifeguards before entering the ocean. Enjoy! Haena Beach Park could have been dreamed from the tropical paradise of your imagination. Mountains covered in dark green foliage stand watch over a stream, as it empties into the sea below. Curves of white sand wind their way gracefully down the coast. Waves crash onto the shore, while white-tailed tropicbirds dive, swoop, and call overhead. You can easily spend a day exploring Haena. Look around the Maniniholo dry cave carved into the mountains, just opposite the lifeguard tower. (Be sure to bring flashlights if that’s your plan.) If you go up the road a mile to visit the blue Waikanaloa wet cave, know that it is not a place to swim. The fresh water there is full of the leptosporosis bacteria, which can really ruin your vacation. 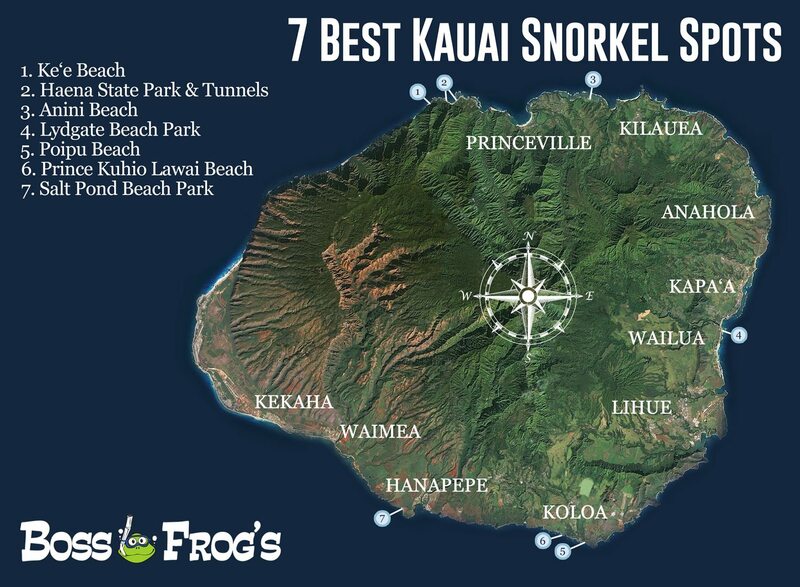 Luckily, just a mile south of your parking spot is one of the best Kauai snorkeling and swimming spots – Tunnels! After parking at Haena Beach Park, you reach Tunnels by walking about a mile south along the grand, sandy beach. Like most north shore beaches, it is almost always safe and calm here in the summertime. There can be great snorkeling days other seasons, too. Check kauaiexplorer.com for daily ocean conditions. Tunnels is a good spot to see sea turtles in their natural habitat – the sea! As you flounder delightfully about, all kinds of fish will surround you. You are likely to see the beautiful parrotfish (uhu in Hawaiian), Moorish idol (kihikihi), and sergeant major (manini). There are also yellow tang, pennant butterflyfish, coronet fish, and bluefin trevally (omilu). Omilu have an absolutely gorgeous outline that flashes like neon when sunlight touches it. Keep your flippers crossed you’ll get to see it happen! Once you arrive at Tunnels, you’ll notice sand channels running through the reef. (From above, sand channels look white or turquoise, while the reef looks dark green or brown.) As with all Kauai snorkeling sites, you want to enter where the sand is. Never step on coral. A sandy entry keeps everyone healthy – your feet will not be cut, and the corals stay alive for lack of stomping. Once you’ve got your gear on, and you’re happily afloat at Tunnels, you only have to swim about ten feet to see the good stuff! The ocean floor here is made up of mostly coral reef and rocks. If you’re an advanced snorkeler, head out past the cove to see the outer reefs! When you exit, use a sand channel for safety. Anini Beach is a lovely strip of sand that offers very good Kauai snorkeling. There are also several facilities to make your time at the beach that much more relaxing. You can bring lunch, walk beneath the huge shady trees, or watch the small boats come in and out of the water at the boat ramp! This beach is kid-friendly, especially in the area to the left, away from the boats. Unlike most north shore beaches, the water here is usually calm all year long. 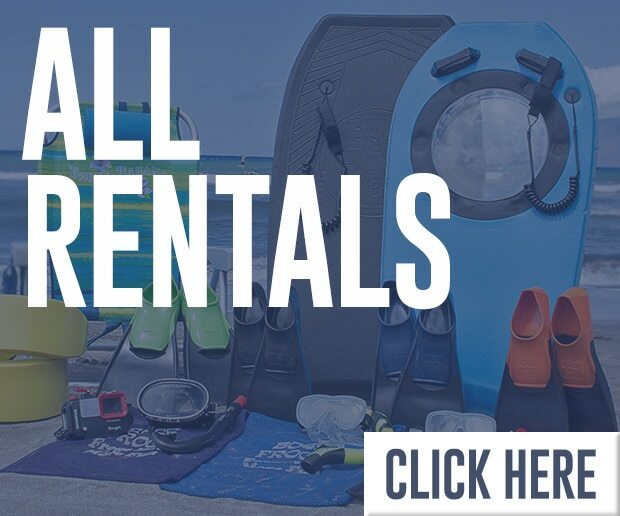 Check kauaiexplorer.com for daily ocean conditions straight from the lifeguards. That site updates each morning around 9:00 am. Anini’s coral reef is chock full of beautiful fish and sea turtles. You will see surgeonfish, unicornfish, and Moorish idol. There are humuhumunukunukuapua’a cruising around. Eels peer from their dens or swim out from coral crevices to go hunting. You might even see a gigantic manta ray or a teeny tiny seahorse hanging in the water nearby! How cool would that be? As always, respect the wildlife and the coral reef they depend on. Do not touch anything while Kauai snorkeling, and give the turtles 30 feet of space to swim as they please. Mahalo! When you are ready to get in, walk down the beach to the left, and enter the water just off the campgrounds. It is sandy and shallow here. For the best fish viewing, swim about 60 yards out to the reef. The water gets deeper as you go farther, to a maximum of about 30 feet. Enjoy yourselves out there, and make sure to keep some energy in reserve for the return trip. If you’re just getting used to swimming and snorkeling, you may want to stay in the shallows just off the beach. The water is beautiful there, and you will see some fish. When you’re in shallow water and you need to take a break, you can touch the sandy bottom! While swimming, pay attention to the boats getting in and out at the boat ramp. Lydgate Beach Park was created by a couple who wanted a safe space for children to swim in the ocean. This is a very family friendly place! This shallow Kauai snorkeling site is protected from the open sea. For the little ones, there is a natural saltwater wading pool. You’ll be able to relax completely, because Lydgate has everything you’ll need: lifeguards, restrooms, shaded picnic tables, trash cans, and a huge playground! For those of you interested in ancient Hawaiian history and culture, you can venture – respectfully, of course – to the edge of the Hikinaakala Heiau. This sacred temple was built for worshipping the sun, and the power of the place can easily be felt today. Make sure to heed the signs declaring “kapu,” and stay off the temple grounds – mahalo! When you’re facing the ocean, the heiau is on the far left of Lydgate Park, near the Wailua River. This Kauai snorkeling site is very interesting, partly because new fish are arriving all the time – carried in by the waves that wash over the walls. You are sure to enjoy watching surgeonfish, chubs, jacks, and milletseed and threadfin butterflyfish. You will also encounter sharpnose mullet, sergeant majors, schools of Hawaiian flagtail (aholehole) and maybe even a pufferfish! How exciting is that? I do not know if turtles make it past the walls, but stranger things have happened. Keep your flippers crossed, and have a great time! Walk anywhere down the sloping sand to get into the water. The waves at Lydgate tend to be gentle, and the water is very shallow at entry. You will have plenty of time and space to get your snorkel gear ready. This Kauai snorkeling site is protected from the open ocean by a rock wall. The sandy bottom slopes up like a bowl, and there are tons of large rocks just inside the outer wall. This is where most of the fish hang out. While you explore along the wall, realize that waves can make it over the wall and hit you. The center is all sand, except for the woody debris that collects on the bottom. It can be very hard to see anything in the center, but also thrilling if you’re willing. If you wait there long enough, a school of large yellowfin surgeonfish is almost sure to swim by and check you out. One of the top Kauai snorkeling beaches, Poipu offers magnificent marine life, great amenities, and a bit of lawn, sun, and sand! It’s also just a short walk from your car to the beach. You can swim, snorkel, barbeque, and relax. The cove here is medium sized, and home to colorful fish of all shapes and sizes. Lifeguards watch over the swimmers in the water. If you walk left, there are amazing tide pools hosting all kinds of tiny marine life. Although pine and palm trees grow at Poipu, there isn’t much shade. You’d do well to rent a beach umbrella or two. Sea turtles (honu) come near the shore quite often at Poipu. While you swim, make sure to give them at least 30 feet of space, if you can. You will definitely see large schools of needlefish, baby unicornfish, and all sorts of butterflyfish. Keep your eyes open for saddleback wrasse, juvenile rockmover wrasse (they look like seaweed! 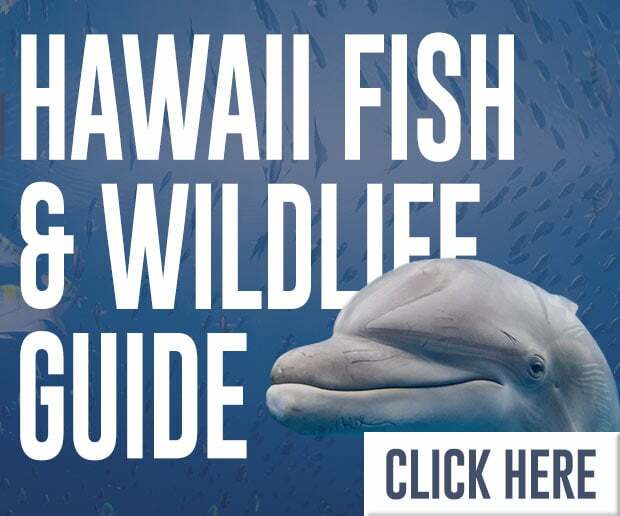 ), and don’t forget the Hawaii state fish – say it with me now! – the humuhumunukunukuapua’a. Enter the water on the far left, where the cove is sandy. The rest of this Kauai snorkeling area is rocky and covered in algae. For your safety and that of the fragile habitat, do not put your feet down on rocks or coral underwater. The best snorkeling is on the right hand side of the cove, just to the right of an underwater rock line. Once you swim to that stone border, don’t try to swim over or climb over it – the water is too shallow. Instead, swim toward shore to detour around the wall, and you will love what you see on the other side! Before you get in the water to enjoy Poipu Beach, it’s always a good plan to ask the lifeguards what you ought to be aware of that day. Have a great time! Tiny Prince Kuhio Beach (aka Lawai Beach) hosts a busy reef underwater, so the Kauai snorkeling here is fantastic. In fact, the fish are so abundant, many offshore snorkeling trips leave from “PK’s” (as the locals call it)! This beach has a little sand, but it’s mostly made of lovely lava rock – not family friendly. This is a good winter snorkeling site, because that is when the water is calm on this coast. There are restrooms and outdoor showers, but no other amenities. This bay is right next to the road, and also next to the Beach House Restaurant. This is not a good place for hanging out, but it’s great for water sports. Parking is sparse, so . . . maybe cross your fingers as you’re driving there? Sea turtles swim by often at PK’s, and you are sure to find the gorgeous yellowtailed coris, needlefish, and rockmover wrasse (a rarity at many other beaches). I have even seen a Hawaiian cleaner wrasse here! You’ll enjoy the graceful coronetfish, several species of butterflyfish, and the ever popular humuhumunukunukuapua’a. As with every Kauai snorkeling site, do not feed the fish, and make sure to give sea turtles plenty of space. Let them swim where they wish. Mahalo! I make it a point to get into the ocean where it’s sandy, to spare the fragile habitat my weight. At PK’s, however, you have to walk on rocky shelves to get in. You’ll find the shelves mid-bay, where it looks light yellow and sandy in the water. These shelves can be slippery, and they can also cut your feet. Wear water shoes for protection, and be ready to start floating as soon as you can. Once in, you’ll find a jetty to the left, rocks to the right, and coral rubble in between. There are truly awesome fish everywhere! Do not go into the cove around the left hand side, just off the restaurant. It is too shallow there to be safe. Because the entry and exit are a bit difficult at PK’s, this Kauai snorkeling site is rated as intermediate. Salt Pond, named after the Hawaiian salt collecting ponds nearby, is a great Kauai snorkeling site for beginners. There is an offshore reef that holds back the big waves. This creates a fairly calm spot for ocean exploration. Lifeguards stand watch, and beach facilities make your day at the shore an easy one. Even the parking here is relaxing – there’s plenty. You can hang out on the lawn, play on the sand, or spend time in the water. Hawaiian monk seals sometimes haul out here on the sand, they like the place so much. If you’re not a seal, it’s best to swim at Salt Pond in winter, when south shore waves are smaller. To check the waves before you drive over, take a look at kauaiexplorer.com. It’s updated daily, and the info comes from the lifeguards themselves! The fish who swim at Salt Pond Park are quite amazing. There are rainbow colored wrasses, Moorish idol, baby parrotfish, baby unicornfish, baby goatfish (do you sense a trend, here? ), and sea cucumbers. You can also expect to find beautiful raccoon butterflyfish, and boring sea urchins. (No, the sea urchins are not boring, they’re quite interesting, but they do bore into rocks and reef.) Take your time hanging with the fish here, and you are sure to enjoy yourself. I even saw some I had never seen before! If you are lucky enough to see an endangered Hawaiian monk seal, what should you do? Give the large mammal a wide berth, and let the lifeguards know about your cool find! The entry here is sandy and simple. However, as you walk down the sloping sand to the water, prepare to sink more than you’d think – the sand here is very squishy! Stones covered in algae line the outer edges of the two coves, but the centers are all sand. The fish swim among the huge rocks, where the water is more shallow. If waves are coming into the coves, expect to be pushed along, as if you’re on a drift dive. This Kauai snorkeling area is fairly protected from the open sea, so even when you move fast, you’ll always stay near shore. Snorkeling is great fun in both coves, but most of the fish are found on the left!